This month we're giving some special attention to the Churchill I and the Churchill VII as our honorary tanks of the month! Enjoy a 30% Credit bonus per battle when playing either of these tanks throughout the entire month of the June! Don't have the Churchill I or the Churchill VII yet? Well you're in luck. We're marking down both of those vehicles by 50% for the next couple of days! Enjoy! The history of the Churchill tank design begins with World War I. The tank had made its debut during the Great War and the invention had more than proved its worth, successfully traversing the mud-and crater-ridden ground of the trench fronts. After the end of the war in 1918, the British considered that the chance of another invasion by Germany was likely and began to prepare accordingly. However, they expected a second war to be similar in style to the first: infantry-based trench warfare. The new tank (designated A20) was designed for these conditions and fitted with a 2-pounder gun and a smoke projector, perfect for attacking infantry units. In 1940, with the conquest of France, the British authorities quickly realized that times had moved on and the old style of trench warfare was no longer valid. Having lost much of their arsenal during the Dunkirk evacuations, the British needed new tanks and they needed them quickly! They retracted the A20 design and issued a modified specification that sacrificed speed for practicality. This was the A22, which went on to become the Churchill. One notable feature of the design was the use of catwalks across the top of the tracks. The Churchill I was introduced, despite known deficiencies and problems with reliability. The British decided it was better to get vehicles on the ground as soon as possible and to refine it later. Around 330 Churchill I tanks and over 1,000 Mark II vehicles were produced and distributed, but they were notably under performing, and were already out gunned by the German panzers. As promised, the designers continued to develop the vehicle and several variants were produced throughout the years. The Mark II had a machine gun instead of the howitzer. The Mark III and IV had bigger guns, first a 6-pounder and then a 75mm. The Mark IV was the most prolific variant, with over 1,600 made. They were used in all theaters of the war and saw a huge amount of combat. The Mark V was fitted with a 95-mm gun, but the Mark VI returned to the 75-mm gun. The Mark VII Churchill was a significant redesign of the concept. It kept the 75mm gun, but the vehicle was much wider and incorporated much thicker armor, resulting in the informal name of Heavy Churchill. The vehicle was first used in the Battle of Normandy. Around 1,600 were produced, and like their predecessors, they were used across the world. The Churchill VII wasn’t without its own problems. The redesign had updated many features of the tank, but the engine wasn’t one of them. This resulted in the new heavier vehicle having a slower speed than the old ones. However, the ruggedness and fortitude of the vehicle made up for this. The Churchill was able to climb hills, and cross obstacles and rough terrain that were impossible for other Allied vehicles. The design also proved to be incredibly versatile and Churchill tanks were adapted for a range of specialist purposes, including flame tanks, armored personnel carriers and engineer tanks. Although several more Marks were developed, no further redesigns were of any real significance. The Churchill continued to serve until 1952 when it was replaced by the highly effective Centurion. It is generally believed that the Churchill tank was named after Winston Churchill, the prime minister of Britain through World War II. However, Churchill himself claimed it had been named after one of his ancestors, a war hero from times past. It is unknown whether he was speaking truthfully or if he was just trying to be modest. A large number of Churchill tanks have survived to the present day, and many can be found in military museums across the whole of Europe and beyond. Of particular note is the Churchill VII at Bovington Tank Museum in the UK, which was the last Mk. VII to ever be built. The Churchill I (tier V) and Churchill VII (tier VI) are both on the British tech tree. The only other Churchill variants available in game are the Churchill Gun Carrier, which is a tank destroyer based on the Churchill chassis, and the Churchill III, which is a premium Soviet vehicle (the British having supplied the Soviets with numerous vehicles through the Lend-Lease program). First, we’ll take a look at the modules and upgrades available for these vehicles. Both vehicles have a stock suspension and a single upgrade. None are transferable. However, research of the Churchill III suspension is required if you want to cut across to the tank destroyer branch via the Churchill Gun Carrier. Otherwise, as usual, upgrading the suspension will improve your rotation speed and the amount if equipment you can put onto the tank. You can see from the table that the rotation speed for the Churchill VII suspensions is less than for the Churchill I. Alas this is the price to be paid for all that extra armor. One thing the Churchill wasn’t known for was innovation in engines. Throughout the entire evolution of the line, the engine remained untouched, and this is reflected in-game. There are two engines available and both are the same for both vehicles. Upgrade to the Bedford on the Churchill for a small but significant power boost that you can transfer across to the Churchill VII. Like the engines, the radios are exactly the same on both vehicles, starting with the Mk I. Upgrade them to get a nice boost in signal range, helping you to remain connected to what your team are doing. 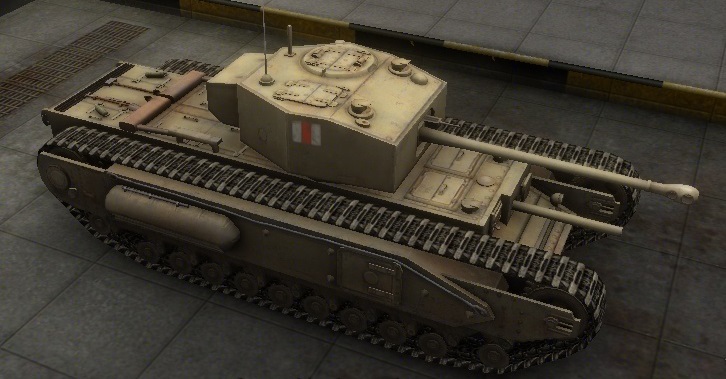 If you research the upgrades on the Churchill I, you can reuse them all on the Churchill VII. The turrets for the Churchill I and VII are unexceptional. Looking at the stats, there seems to be little reason to upgrade from the stock turret on the Churchill I, and indeed other than a small increase in view range, there is little bonus to be had. However, in order to get the bigger guns and to advance to the Churchill VII, it is necessary to research the turrets. The upgraded turret is also needed to mount some of the bigger guns. Note that Churchill I turret front is rounded, while in some cases this helps to increase the effective thickness of the armor, in other cases the lower curve may act as a shot trap. The decrease in maximum thickness of the armor is also balanced by an internal gun mantlet. Upgrading the turret on the Churchill VII offers a more obvious advantage, granting a large increase in armor, especially on the front! There are a lot of guns to choose between for these two vehicles, some of which can be transferred between them. The choice between the standard guns and the Howitzer types is purely a matter of play style. Howitzers sacrifice penetration and accuracy for much bigger damage. Note that the 3.7-inch howitzer has extremely steep shell trajectory that makes hitting targets at range harder, but you have high chance of hitting the roof armor. On the Churchill I, the QF 6-pdr Mk. III and Mk. V must be researched before you can move on to the Churchill VII. Fortunately, the Mk. V can be reused on the heavier tank. The top two guns are optional, but worth researching as again, you can reuse them on the Churchill VII. The choices for the Churchill VII are also varied. The basic gun line will already be available to the end if you researched them for the Churchill I. Once again, you can choose a Howitzer if you prefer that play style. The top gun, the 77mm, costs a large amount of experience points, but it does pack the biggest punch. What’s more, it must be researched before you can move on to the Black Prince, so you may as well buy and mount it after researching. One important tactical and historical note though: The top long-barreled high-velocity guns take up a lot of space in the turret. This in turn limits their depression, in contrast to smaller weapons. If you like fighting from hull-down positions, you will have to stick to the six-pounders, while if you want the high penetration guns, you will need to rely on hills to limit your engagement opportunities. There are a few choices for equipment to mount on the tank. When picking regular consumables, make sure you pack your repair kit. The tracks are the weak spot on these vehicles, so if you want to keep moving, being able to repair them quickly is a must. Improved Ventilation: Keeping your crew happy will improve the performance of the tank throughout, giving you a slight edge over other opponents. Toolbox: Keep those tracks running! The toolbox is essential for making repeated repairs. Spall Liner: Your armor is your strength, but your low speed makes you a target for ramming attempts. Pack a spall liner to improve your durability against ramming and explosions. Vertical Coil Springs: These will improve your durability even further. Gun Rammer: Speed up reloading and fire more quickly. The Churchill is a tank in the truest sense of the word. A slow speed but heavy armor means that you should be the mobile shield from behind which your more fragile but nimble team mates can take cover. Your armor will protect you very well from pretty much any opponent of equal or lower tier. This is reason to celebrate if you find yourself near the top of the battle list; just plow onwards towards the enemy base and listen to the sound of bounces and ricochets as your enemies fruitlessly try to stop you. Even when facing heavier enemies, the Churchill I still sports exceptionally thick 177mm armor on a small part of the front hull around the hull-mounted howitzer. This trait is shared with the Premium Churchill III and can come in handy when you need to peek around corners. Watch your tracks though, as they are vulnerable and easy to break. This is improved on the Churchill VII as the tracks have protective armored covers, but is still something to be careful of. You will also need to be wary of artillery. The top of your turret is wide and flat, so try to stay in cover when you can. The main weakness on these vehicles is the damage of the guns. Your damage is not great, although upgrading to the top gun for both vehicles will improve it. This is countered to some extent by the rate of fire, which is excellent. Make up for your lack of damage by firing repeatedly to keep your enemies on their toes. If you do crave a bigger boom, experiment with fitting the Howitzer-type guns to your tank, sacrificing speed and accuracy for a bigger explosion.